These 55-gallon drum mixers ROLL A DRUM ON ITS SIDE for a gentle mix within the drum. These 55-gallon drum mixers rotate a drum END-OVER-END for a more vigorous mix inside the drum. They turn a drum continuously in one direction. 55-gallon drum mixers roll your drum on its side to gently blend the contents. Take upright drum and tilt over for rolling. Add option for plastic drum mixer. Safety Enclosures for Portable Drum Rollers. Drum 55-gallon drum mixers allow you to mix the contents of a closed steel, plastic or fiber drum. Lift an upright drum with your hoist, crane a Morse drum lifter to load it into the Drum Tumbler. Mix 30 to 55-gallon (114 to 210 liter) steel, plastic or fiber drum. 55-gallon drum mixers turn a drum on its side. Drum roller models to mix contents of one or two drums at a time. Require placing drum onto roller. Tilt-To-Load 55-gallon drum mixers have powered drum lift, and vigorous "corner-over-corner" drum mixing to thoroughly blend contents. 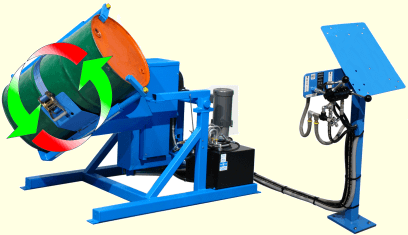 Tilt-To-Load Drum Tumblers rotate a 30 to 55-gallon (114 to 210 liter) steel, plastic or fiber drum. Hydra-Lift Drum Rotators / 55-gallon drum mixers powered hydraulic system lifts upright drum from floor level and places it for rolling on the drum mixer. Program to automatically lift your drum, rotate for the time you set to mix drum contents, and then return it to upright position at floor-level for easy handling. The ultimate in 55-gallon drum mixing equipment (200 liter drum mixing equipment). CE-Marked 200 Liter Drum Rollers include the Controls, and the Safety Enclosure with Interlock. 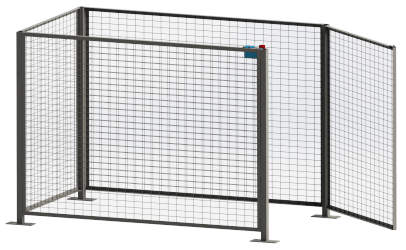 They are certified to be in compliance with European machine directives. CE-Marked Drum Tumblers include the Safety Enclosure and Controls. They are tested and certified in compliance with European directives. 200 Liter drum mixers complete with controls and safety enclosure. Mix products inside your sealed 1 to 5 gallon cans or pails with these can rotators to reduce hazards and save clean-up. Single and double can mixers available. IMPORTANT - OSHA holds the employer responsible for the suitability of design and application of tools and machinery. For OSHA compliance in the USA, see OSHA subpart O.1910.212(a)(4) "Barrels, containers, and drums. Revolving drums, barrels, and containers shall be guarded by an enclosure which is interlocked with the drive mechanism, so that the barrel, drum, or container cannot revolve unless the guard enclosure is in place." Mix drums of paint, oils, urethane resin, plastisol, glue, dyes, flavors, etc. . . .and my favorite, "Roll propellant casting tubes for chemical prep prior to cast"
What will you use your 55-gallon drum mixer for? Industrial drum mixing equipment - All Morse 55-gallon drum mixers (200 liter drum mixers) are used to mix contents right inside a sealed drum.